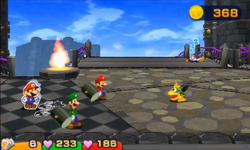 Bad Nabbit is the fifth mission of Bowser's Castle in Mario & Luigi: Paper Jam. This mission takes place in and around Neo Bowser Castle. The objective for Mario and co. is to catch Nabbit many times as well as team up with him in some enemy fights. In the first phase, Nabbit will send out four Paper Paragoombas to battle Mario and co. In the second phase, Nabbit will assist Mario and co. in battle against two Broozers. In the third phase, Nabbit will send out three Paper Boo stacks to battle Mario and co. In the fourth phase, Nabbit will assist Mario and co. in battle against a Shy Guy, a Chain Chomp, a Paper Chain Chomp, and a Paper Sombrero Guy stack. In the fifth phase, Nabbit will send out six Mechakoopas to battle Mario and co. In the sixth phase, Nabbit will assist Mario and co. in battle against a Shy Guy, a Chain Chomp, a Paper Chain Chomp, a Broozer, and a Paper Broozer. In the seventh phase, Nabbit will send out four Mechakoopas to battle Mario and co.
Once all seven phases are cleared, Nabbit will run off in thanks, thus completing the mission. "Face off against Nabbit - and team up with him - in a wild chase through Neo Bowser Castle!" "Defeat all enemies and catch Nabbit." Kuppa Shiro de Totsuzen Totten! Sudden Nabbit in Bowser's Castle! This page was last edited on December 4, 2017, at 00:35.